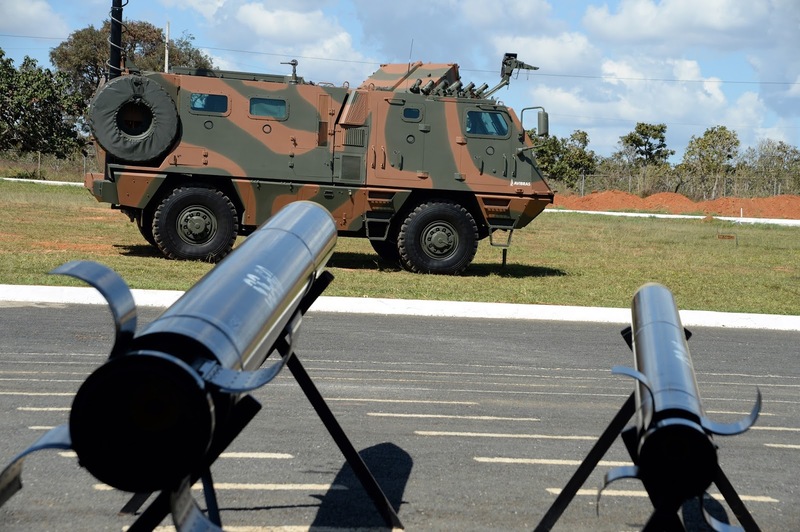 For the uninitiated, these are multiple launch rocket artillery systems made by the USA and Brazil respectively. 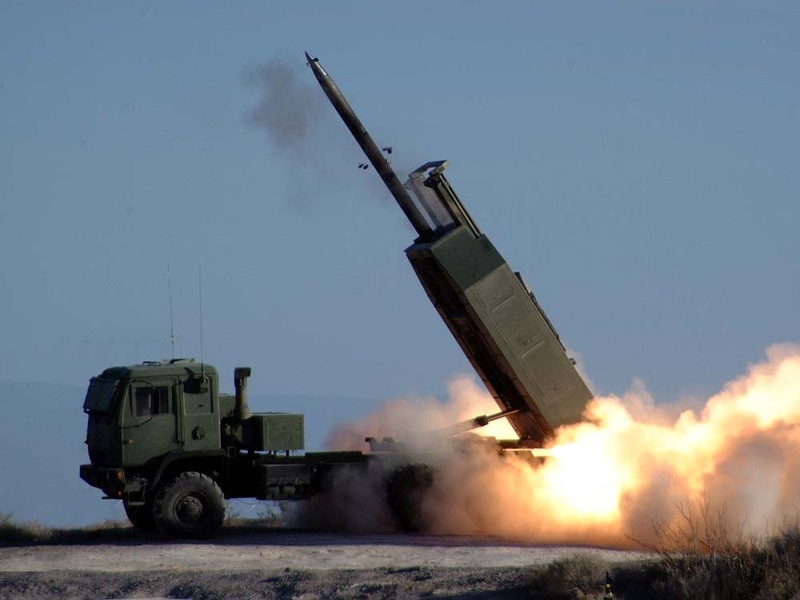 They have been exported to many other countries, including Malaysia ( ASTROS II ) in 2002 and Singapore ( M-142 HIMARS ) in 2009. 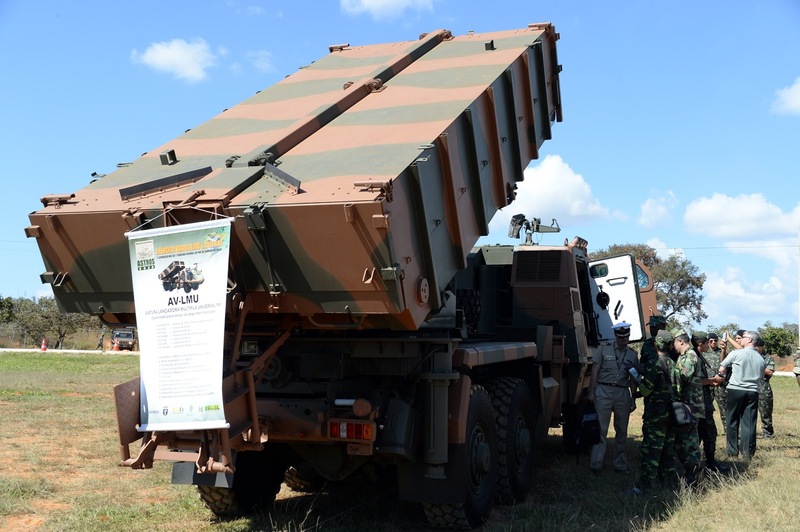 Malaysia became the second country in South East Asia to operate rocket artillery systems when it procured the ASTROS II. The honour of being the first goes to Thailand. 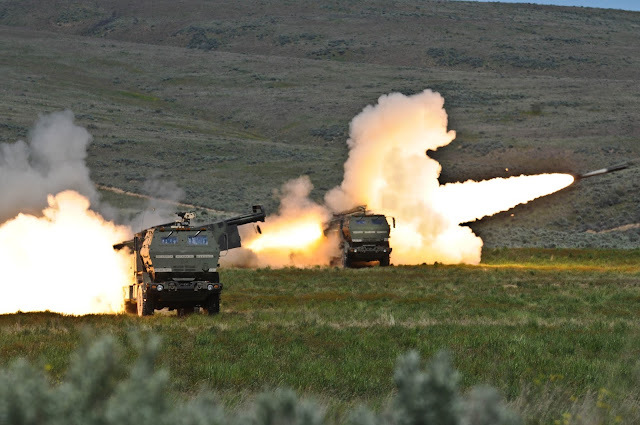 By nature, rocket artillery are more suited for offensive operations rather than for defence. So it will not be easy to justify such a purchase unless your neighbour does it first. 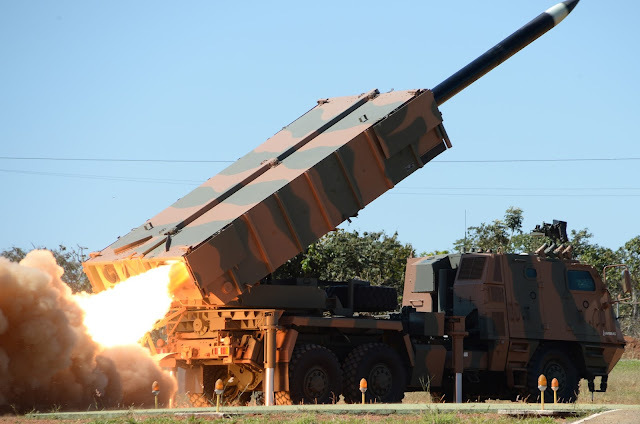 It came as no surprise therefore that once Malaysia has acquired that capability Singapore also ordered rocket artillery systems to boost the firepower of its Army. 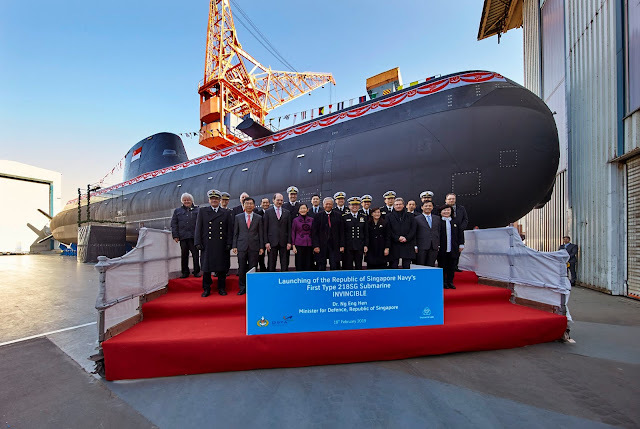 The US government would not have approved the sale if Singapore's neighbours had not acquired that capability first anyway, as they have always been reluctant to allow the introduction of a new capability into any region. Ever since its invention by the ancient Chinese scientists sometime around the 13th century, the rocket, in its various forms, had been deployed as a weapon of war. 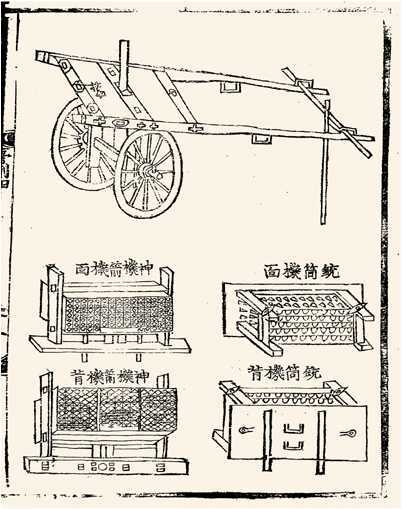 The Chinese and Koreans had their own primitive version of the multiple rocket launcher which fired one or two hundred blackpowder projectiles upon ignition. For centuries since then, the rocket had remained largely for ceremonial use in fireworks and such. 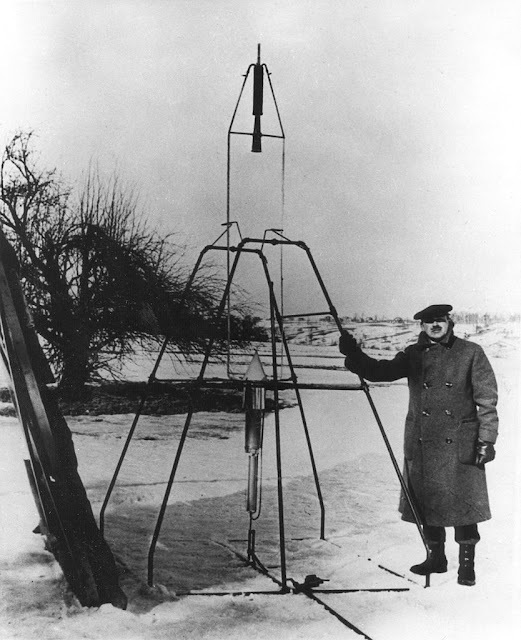 It was not until the 20th century that modern rocketry was founded, with the American scientist Robert Goddard attaching a supersonic nozzle to the combustion chamber of a liquid-fueled rocket engine, increasing the efficiency of the rocket engine from 2% to 64%. He was also the first to launch a liquid-fueled rocket in the year 1926. Since then advancement in rocket science has been rapid and relentless. With World War II came the production of new weapons such as the anti-tank rockets, tank, truck or ship mounted multiple launch rocket systems, air-to-ground rockets, rocket powered fighter planes, and the V-1 and V-2 missiles. Post World War Two saw the development of multi-staged rockets that would evolve into launch vehicles for nuclear weapons. Eventually, these ballistic missiles were modified to launch artificial satellites into earth orbit and beyond, leading ultimately to the moon landing in 1969 and allowing for unmanned exploration of the inner solar system. 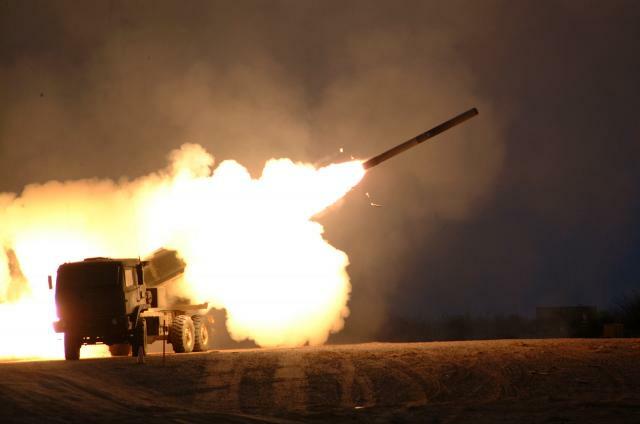 The first iron-cased metal cylinder rocket artillery were developed by Tipu Sultan, the Indian-Muslim ruler of the Kingdom of Mysore, and his father Hyder Ali, in the 1780s. He successfully used these rockets against larger forces of the British East India Company during the Anglo-Mysore Wars. These Mysore rockets were more advanced than anything the British had at that time mainly because the iron tube that held the propellant powder allowed for a higher internal pressure to develop during combustion and achieve a higher thrust and therefore longer range. 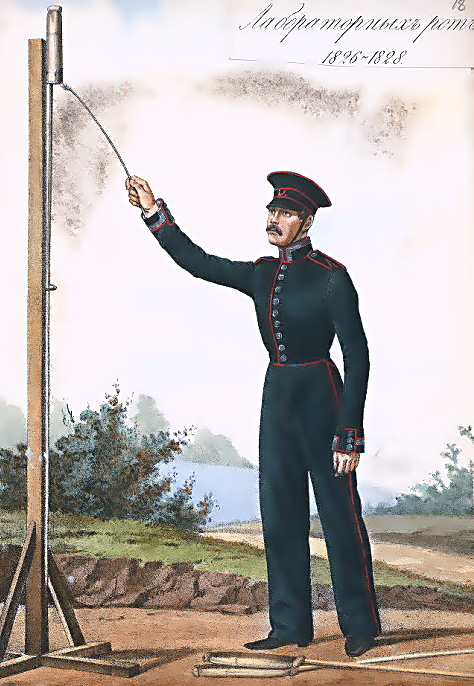 The rocket was lashed with leather thongs to a long bamboo stick and had a range of perhaps three quarters of a mile ( 1.2km ). They were hurled into the air after being lighted or were allowed to skim along the surface of the dry ground. Although individually they were not in anyway accurate, their effect when deployed in mass numbers can still be devastating. They were particularly effective against the cavalry. During the Battle of Seringapatam in 1792 and 1799, these iron rockets were used to considerable effect on the British. The eventual defeat of Tipu meant that the British captured a number of the rockets which deeply influenced subsequent rocket development, ultimately inspiring the Congreve Rocket which was used during the Napoleonic Wars, including the Battle of Waterloo, and other wars during the 19th century. 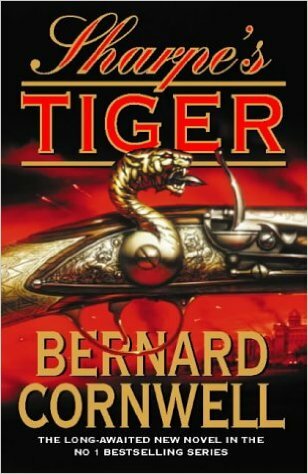 You can read about the fictionalised Battle of Seringapatam in Bernard Cornwell's Sharpe's Tiger : Richard Sharpe and the Siege of Seringapatam (1799) where a young British Redcoat by the name of Pte Richard Sharpe fought the Tippu Sultan Army and eventually killed Tippu and horded some of his treasures. 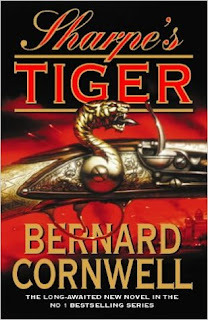 Cover art of Sharpe's Tiger by Bernard Cornwell. 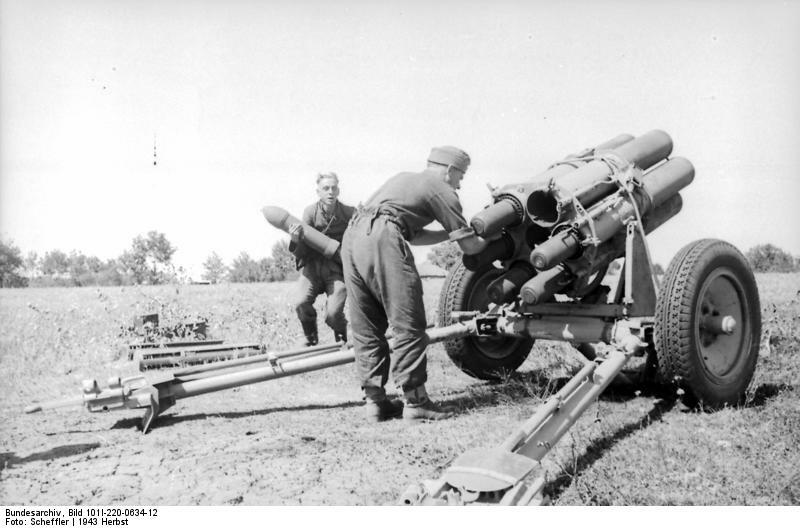 During World War II, it was the Germans and the Russians who developed and deployed large numbers of rocket artillery. The Germans had the Nebelwerfer series of towed rocket artillery although some were self-propelled ( Panzerwerfer ) and the Russians had their Katyusha series which were usually vehicle mounted and therefore more mobile. 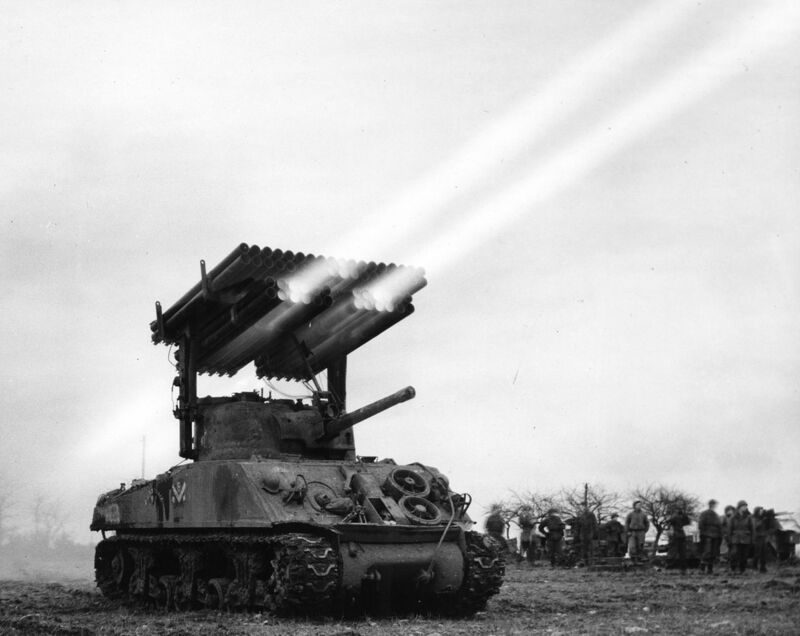 The Americans and British were late to develop their rocket forces with the US Army eventually mounting rocket launchers on top of modified M-4 Sherman Tanks. These were known as the T-34 Calliope rocket tanks. The US Navy however, made extensive use of rockets fired from warships and landing crafts during the Pacific War to soften up Japanese-held islands before an amphibious landing. 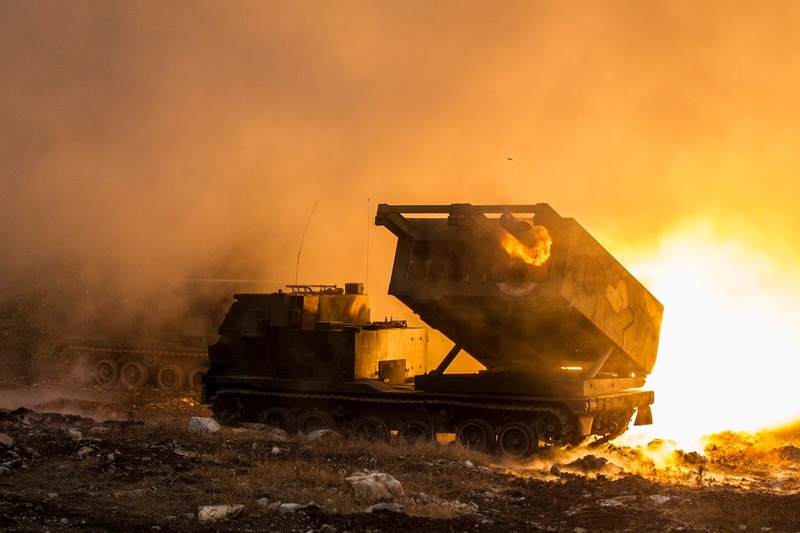 Since World War II, having seen the destructive firepower of rockets deployed in masses on area targets and the terrifying psychological effects the rockets bring about on the enemy, many nations have developed their own rocket artillery systems. The ASTROS II ( Artillery SaTuration ROcket System ) is made by Avibras Aerospatial SA of Sao Paulo, Brazil. Avibras has been manufacturing MLRS since the 1960s. In the early eighties, a middle-eastern country, believed to be Iraq, requested Avibras to develop a mobile modular MLR system and the result was the ASTROS II. It was used against Iran during the 1980-1988 Iran-Iraq War. 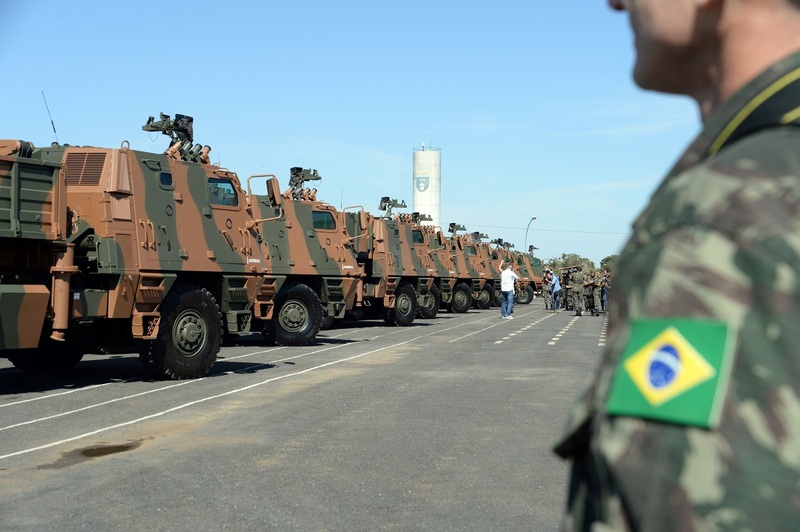 Currently it is in operation with the Brazilian Army, Saudi Arabian Defense Force, the Malaysian Army, and the defense forces of Bahrain, Qatar, Angola and soon Indonesia. 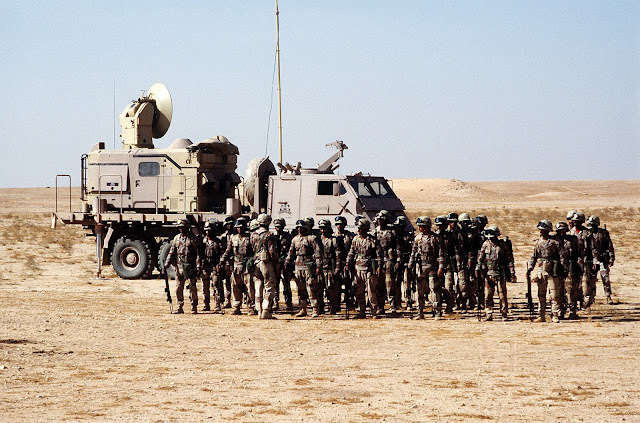 The ASTROS II is a battle-proven system which was also deployed by the Saudi Arabians during the first Gulf War in 1991 and by Angola in their civil war against the UNITA forces. 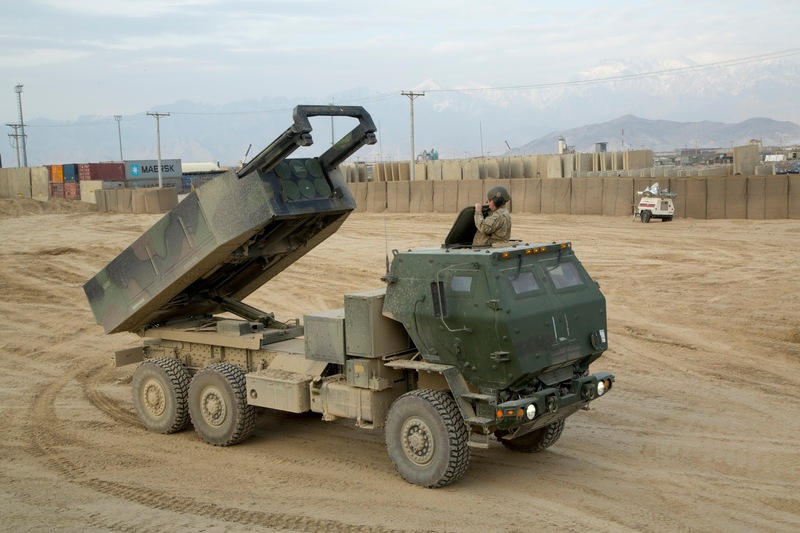 The ASTROS II is basically a self-propelled multiple rocket launcher mounted on an all-terrain 6x6 wheeled vehicle. It features modular design and employs rockets with calibre ranging from 127mm to 300mm. 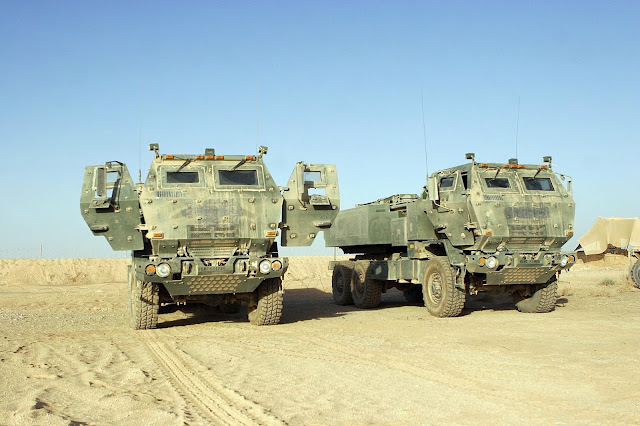 It is usually deployed in batteries consisting of 6 launcher vehicles with 6 ammunition resupply vehicles and a radar equipped fire control vehicle, all mounted on the same Tectran 6x6 chassis. 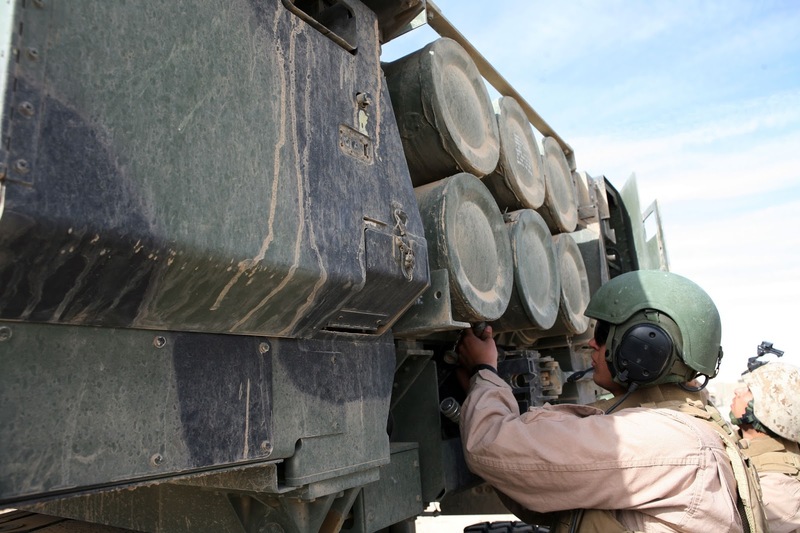 Each resupply truck carries 2 complete reloads. 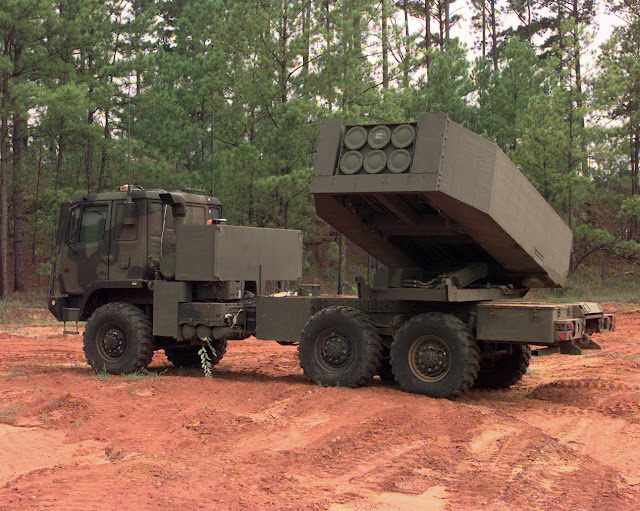 Malaysia bought 18 ASTROS II launchers in 2002 and another 18 in 2007. This will enable it to form 6 batteries in total. The trucks can reach a maximum speed of 90km/h on the road and 40km/h over rough terrain. They are largely unarmoured, therefore do not provide much protection against enemy fire. They also do not provide protection against nuclear, biological and chemical agents. A 0.5in heavy machine gun is mounted on the roof of the cab for self-protection. They are equipped with 6 smoke grenade launchers. The entire system is air-portable on the C-130 Hercules transport aircraft which the Royal Malaysian Air Force also operates. 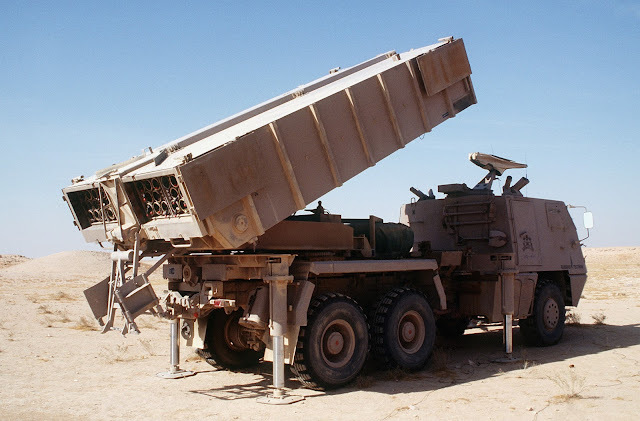 The ASTROS II launcher is capable of firing rockets of different calibre with different warheads. The SS-30 variant consist of 127mm rockets packed 32 rounds to a launcher and has a range between 9km to 30km. 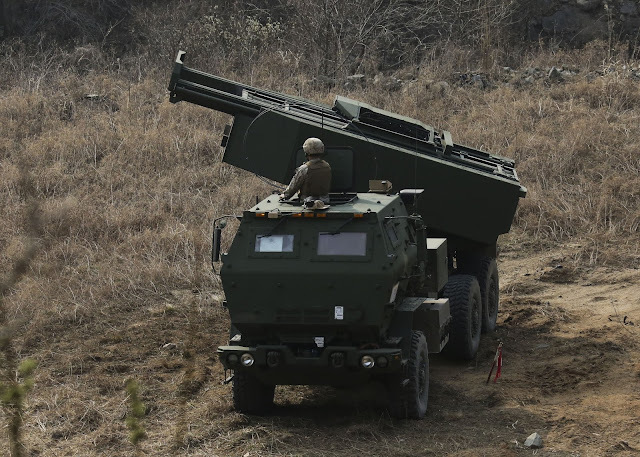 The SS-40 variant is made up of 180mm rockets packed 16 rounds per launcher with a range of 15km to 35km. The SS-60 and SS-80 variants pack 4 300mm rockets per launcher and have ranges of up to 60km for the SS-60 and 90km for the SS-80. The warhead options include the traditional high explosive - fragmentation warheads, cluster munitions with multiple dual purpose ( anti-personnel , anti-armour ) bomblets, high explosive white phosphorous incendiary warheads, smoke deploying and mine deploying warheads, runway denial warheads and also chemical warheads. 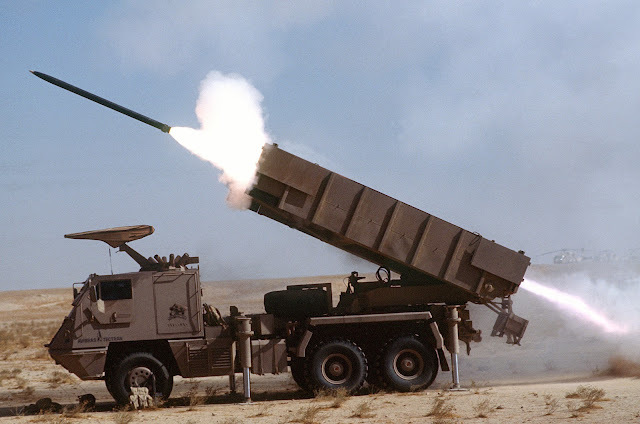 The M-270 MLRS is an armoured, self-propelled, fully-tracked multiple launch rocket artillery system that was designed in the late 70's and in service with the US Army and several of its NATO and non-NATO allies since the early 80's. Production had ceased since 2003 when the last batch had been produced for Egypt. It fires 227mm guided or unguided rockets packed 6 to a pod, 2 pods to each launcher. 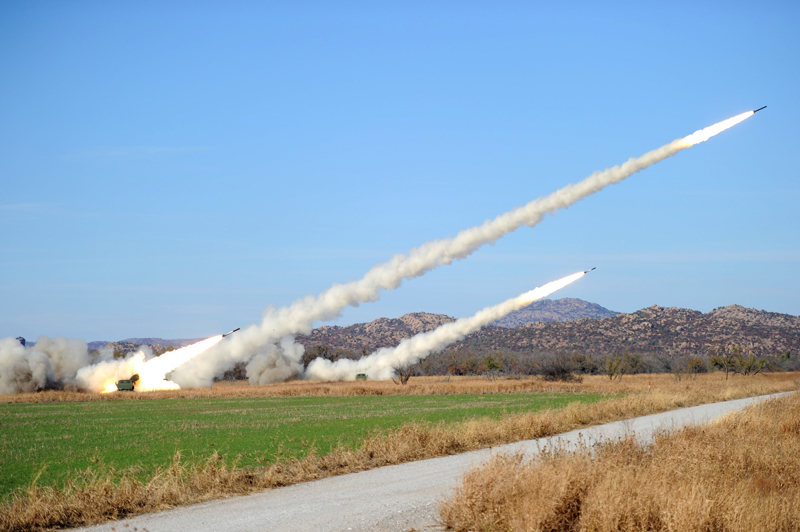 It can also fire the long range ATACMS ( Army TACtical Missile System ) ballistic missile one to each pod. It is a versatile weapons platform designed to supplement traditional tube artillery by delivering massive volumes of firepower in a short span of time against high value, time sensitive enemy targets under all weather conditions across the entire depth of the tactical battlefield. Some of these targets include enemy forward air defences, armoured units, artillery placements and personnel. Effective as it is, the M-270 is rather heavy at close to 25 tons. 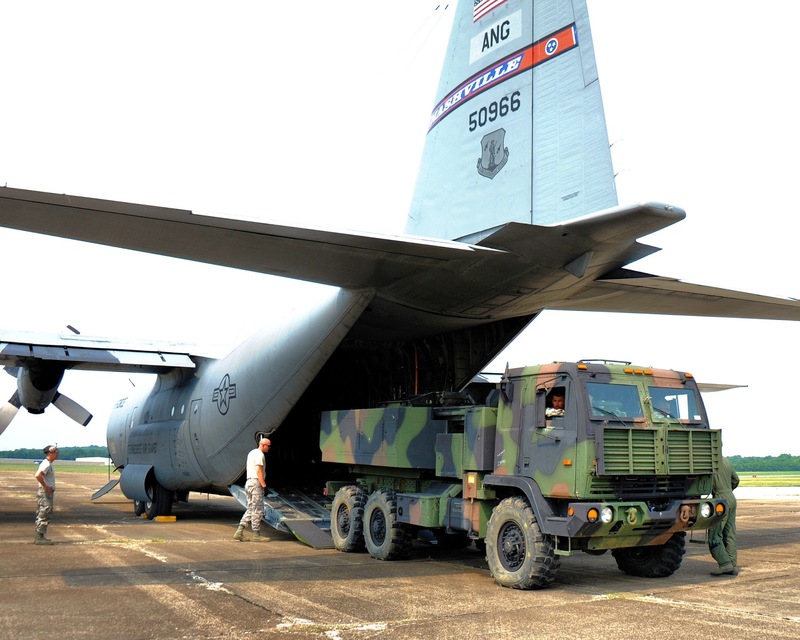 It can only be air lifted by the C-5A Galaxy, the C-17A Globemaster or the C-141 Starlifter heavy transport. Hence the development of a lighter wheeled version - the M-142 HIMARS ( High Mobility Artillery Rocket System ). 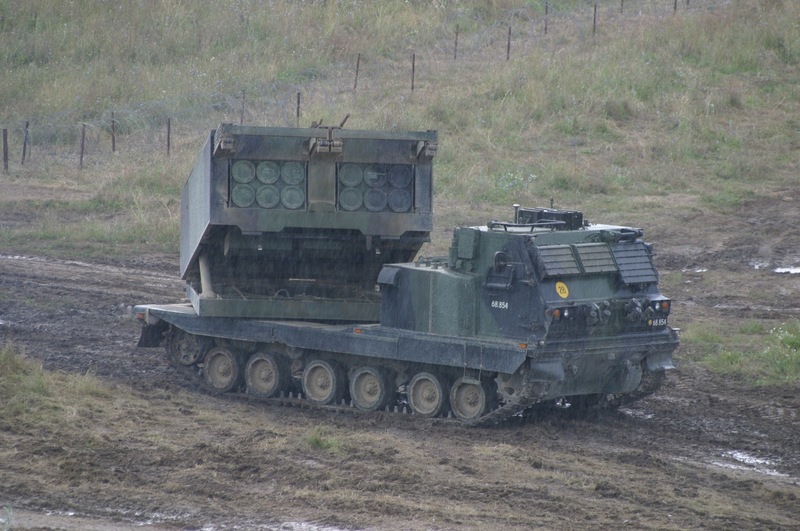 Danish M-270 MLRS in the rain and mud, 2003. Photo via wikicommons. 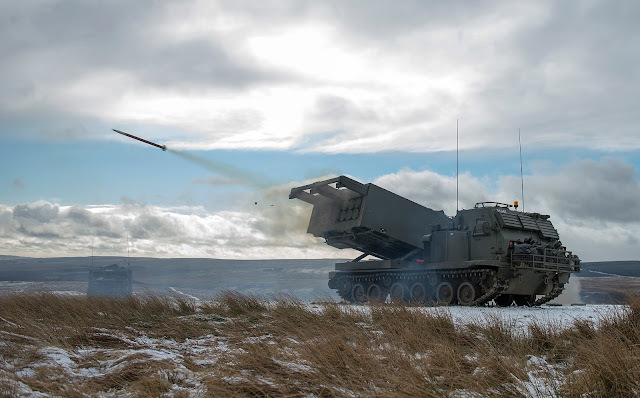 British Army M-270 firing practice rounds at Otterburn 2015. Photo via wikicommons. 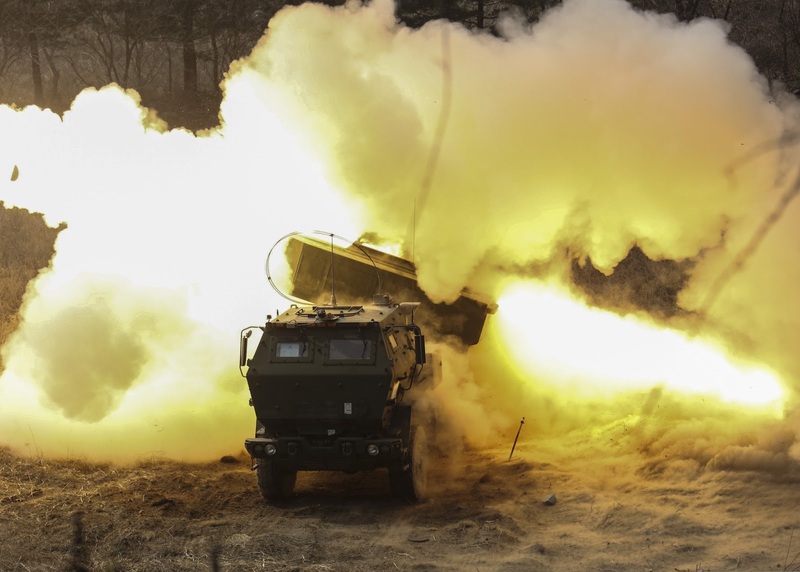 German M-270 MLRS firing in 2013. Photo via wikicommons. 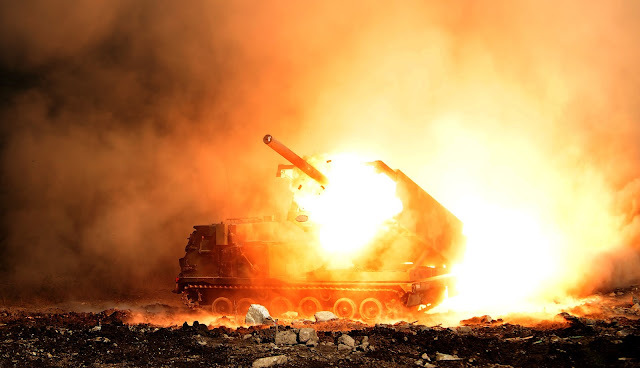 Awesome South Korean Army 5th Artillery Brigade M-270 night firing. Photo via wikicommons. 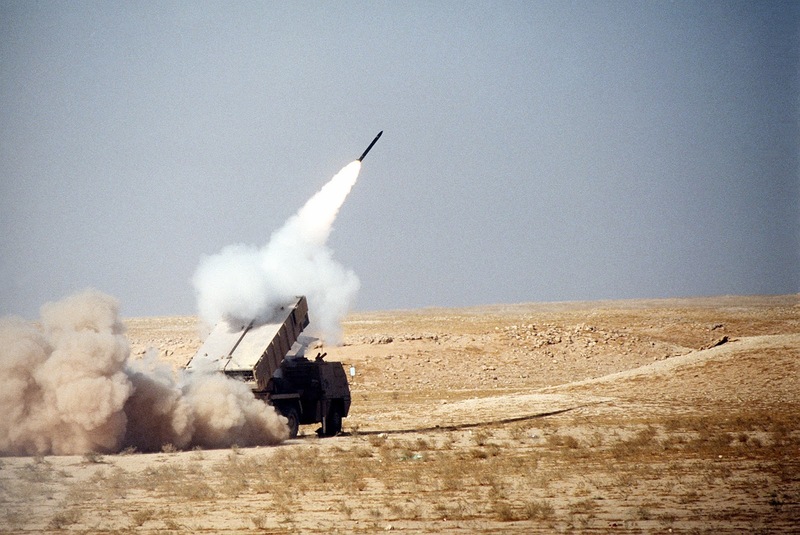 The M-142 HIMARS is essentially a M-270 Lite. 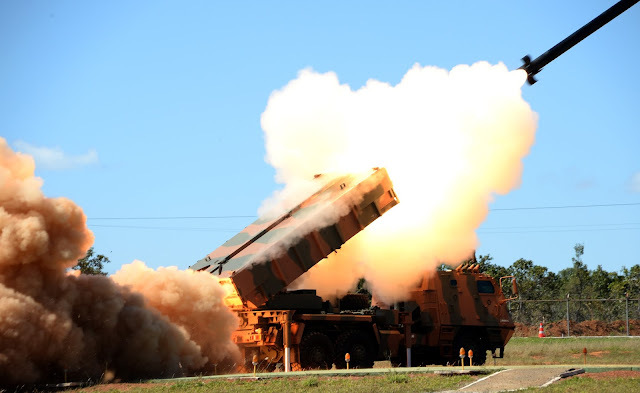 It shares many commonalities with its heavier cousin, using the same command, control and communications system, fire control system and launcher module. It carries one instead of two launcher pods and at about 11 tons is only half as heavy as the M-270. It is transportable by the C-130 medium transport ( roll-on roll-off ) and can be operationally deployed within 10 mins of landing. 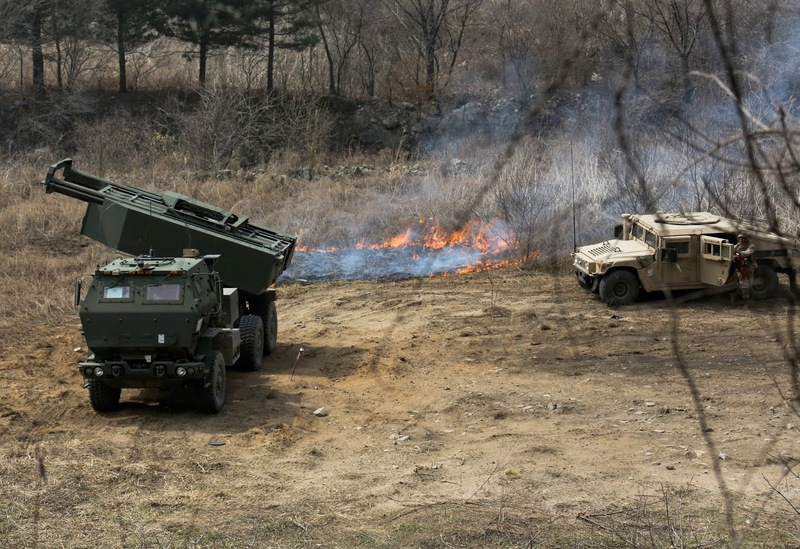 The HIMARS has an armoured cabin and can travel at speeds of up to 94km/h on paved roads. It is usually operated by a crew of 3 but the automated fire control system can be managed by even a single crew member if necessary. The HIMARS is in service with the US Army, US Marines, UAE, Jordanian and Singapore Armed Forces. Singapore has acquired 18 launcher units with 32 XM31 unitary high explosive pods making the Singapore Armed Forces the first HIMARS operator outfitted entirely with GPS guided MLRS. So in a head to head duel, which system will prevail? 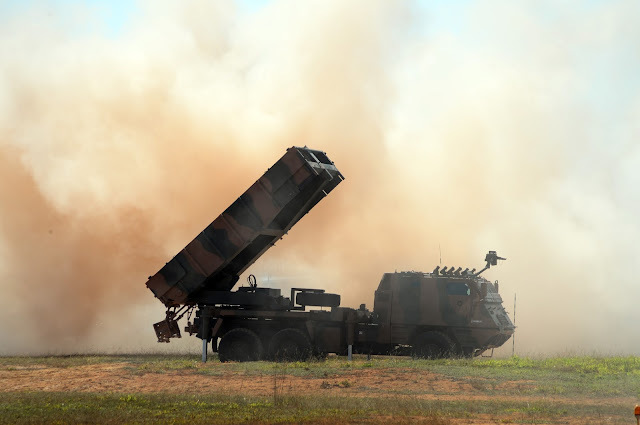 The ASTROS II's modular nature allows for rockets of different calibre to be deployed according to target type and range, in contrast to the HIMARS which fires rockets of fixed calibre, not counting the ATACM tactical missile. 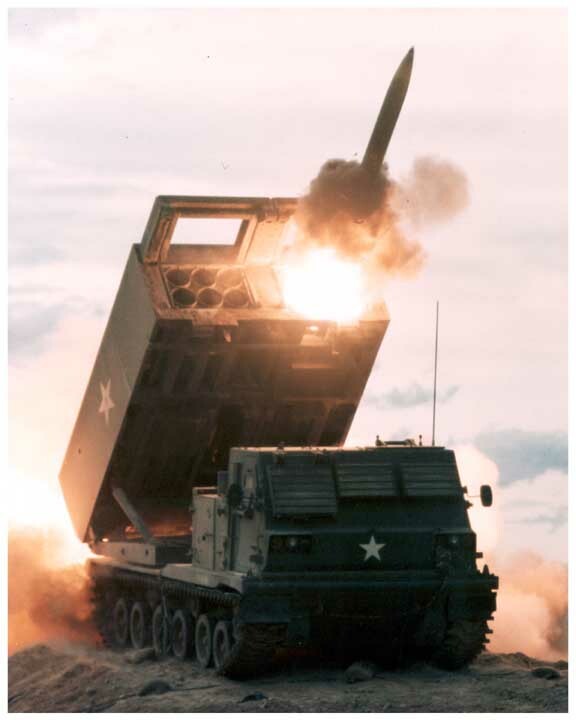 The unmatched advantage of the M-142 HIMARS over the ASTROS II is the availability of GPS guided rockets. 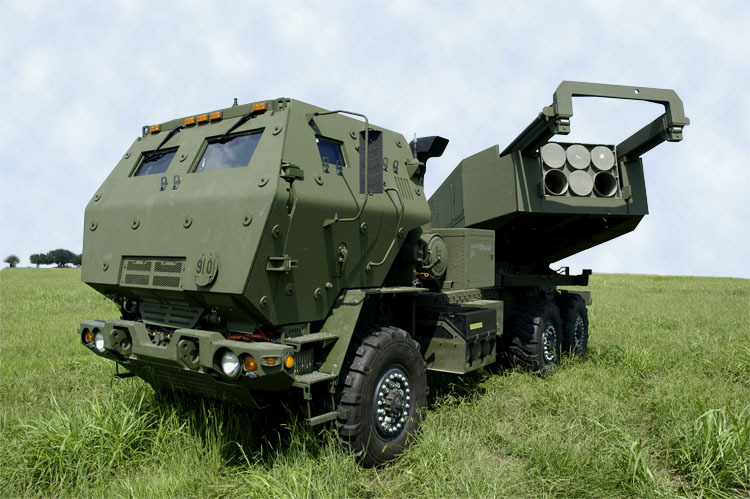 The GMLRS has a range of up to 70km and an improved version the GMLRS+ up to 120km. 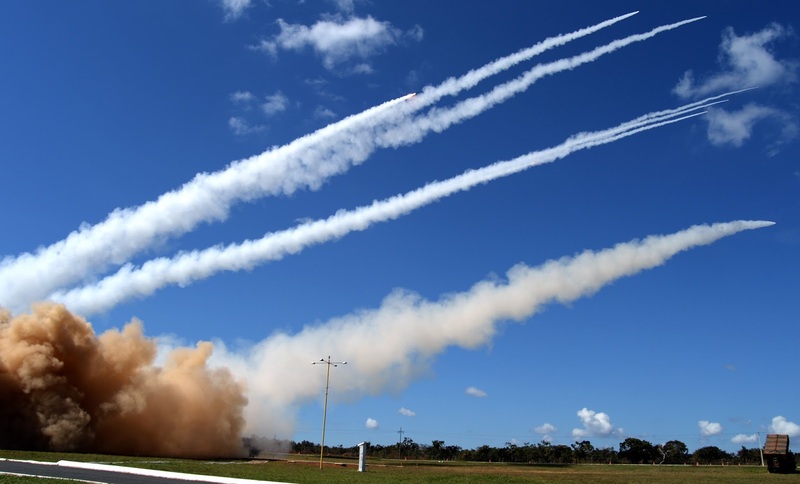 GPS guidance significantly increases the accuracy of the rocket and for the unitary version reduces collateral damage and civilian casualties. 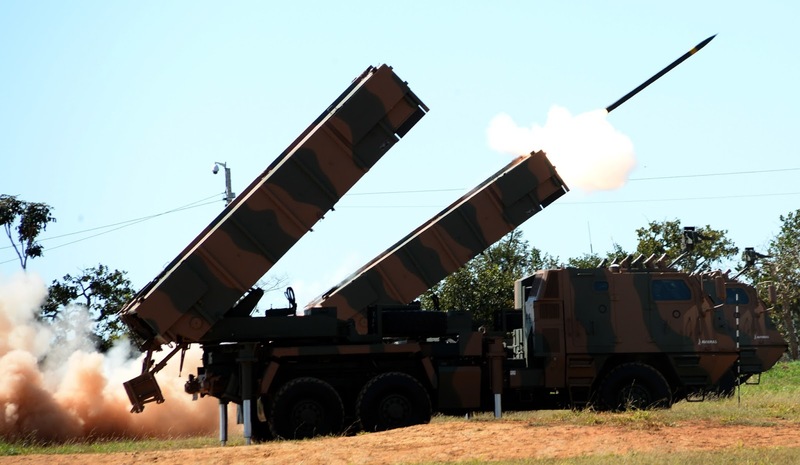 GMLRS has been nick named the 70km sniper for this long range precision capability. 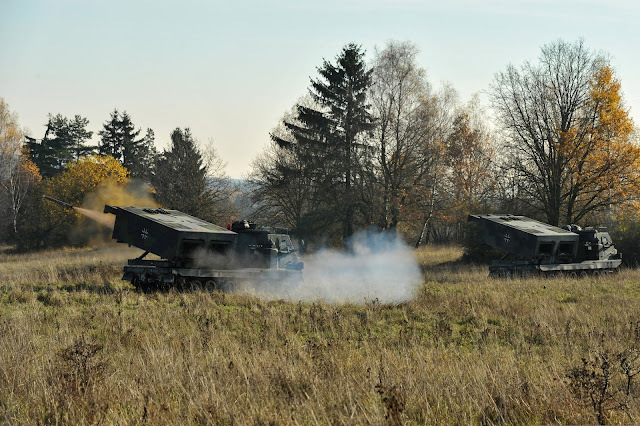 At the end of the day, one must realise that the ASTROS II is an older system dating from 1983 and fires unguided rockets, though it is still a formidable artillery system at this day and age and should not be underestimated in anyway. Until the ASTROS 2020 upgrade is completed and the system acquires the capability to fire the precision strike missile AV/MT-300 which has a range of 300km and a payload of 200kg not unlike the ATACM, I would consider the HIMARS a more advanced system. Seems like 2016 is upon us and the world has moved on. 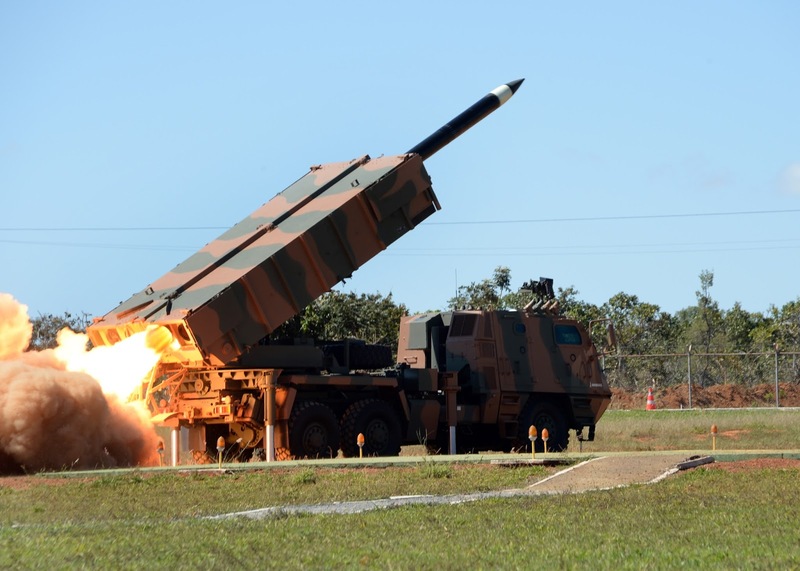 The Avibras ASTROS 2020, sometimes known as the ASTROS III, is now a reality with the Brazilian Army. Unless otherwise stated, all ASTROS 2020 photos below were taken in June 2014 by Jorge Cardoso via Wikicommons. Wondering if you can write something about the Endurance 160. Do you think it will be built? Do you think Singapore will ever want or afford a light carrier battle group? 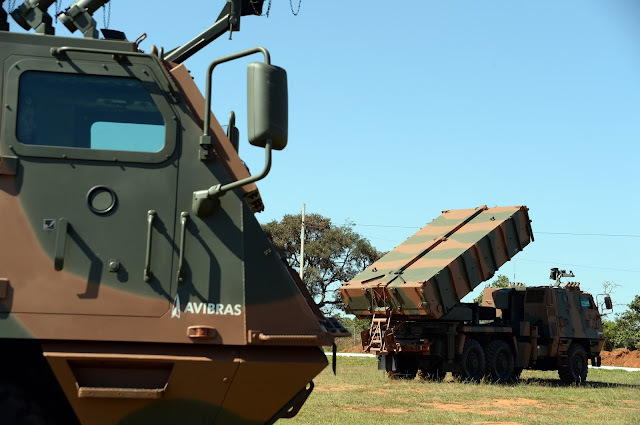 astross 2020 av-mma will hv 300km tactical missile and sam..it will be nightmare to singapore defend their island raining by thousand rocket..how do u know astross is outdate system hahaha even 1 ss80 missile can wipeout 4 football field..i doubt admin is singapaporean..